Yes, it’s all the pieces of the story in one long location. If you read all the individual parts there’s nothing new here, but now it’s easier to link to. So that must count for something! Introducing the Sputnik Soapbox, where your Raconteurs Recount Realistic and Ridiculous Rally Racing Remembrances Really Remarkably. Follow along, friends, as two amateurs with only the most basic of skills build a rally car from scratch and then trust it with their very lives! What horrible mutation could lead to such a decision? Exposure to Gamma rays? Cosmic rays? Vita-Rays? Surely there must have been SOME kind of rays involved… After all, there usually are. Follow along as we unravel the story, from their humble origins in poverty and TSD rallies, through the early years of training and non-stop bombardment with the glories of Communism (and presumably rays of some sort, true believers!) to the eventual nuclear resurrection of an all-wheel drive turbo monster from the past! Our story begins in the 1990s with two young men who are busy not living up to their potential. They meet in downtown Terminal City and become friends over aggressive music and beer. Lots. Of. Beer. As time passes our heroes (Ed – really?) apply at least half their asses to learning something, and as the computer fad replaces Pogs at the turn of the century it is possible for even these two to get reasonable daytime jobs by convincing people that they know something about the fancy adding machines. Fast forward to the thriving metropolis of Schomberg, Ontario in 2005. Thanks to the Intertubes they are exposed to Time Speed Distance (TSD) mini-rallies (Ed – and gamma rays, surely?!) which are being put on by the Maple Leaf Rally Club out of a nearby truck stop. Like fools, they enter one (the Greenspond Go-round), they come in 14th (out of 15) and are hooked immediately. And thus their fate is sealed. Thanks to some poor life choices they have only one vehicle between them that is likely to survive even these mild dirt roads; a Jeep TJ. 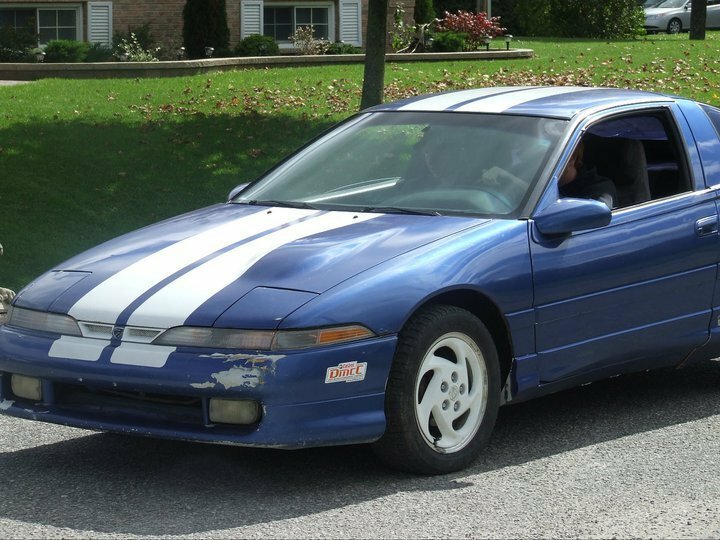 This is far from an ideal rally vehicle for a variety of reasons – live axles, stiff suspension, low power, real four wheel drive which shouldn’t exceed 80 kph, poor brakes, useless headlights – but is worlds better than the other options: a 1990 Acura Integra or 2002 Honda CBR 954. They decide to press on with their sturdy but less than ideal steed and even enter several overnight winter rallies, which are a kidney-jarring, Cosmic ray-exposing, guaranteed good time. The seed thus planted (Ed – by Department K, surely), our protagonists begin to volunteer at performance rallies. This activity consists mostly of being terrified of getting something wrong while dealing with bugs (some of which have a size that can only be explained by radioactive testing), uncomfortable temperatures, and handling equipment issues on the fly. This last one will come in handy later. They are also exposed to really cool cars up close, great people, and the mysterious inner working and secret circles of performance rallies. And the ways of the ancient gods. It’s straight out of Lovecraft, really. By 2008 they are clearly down with the sickness, as demonstrated when the replacement for the 1990 Integra – after 495,000 kms, go Honda – is the most rally fan boy car possible: a 2004 WRX. In World Rally blue, of course. Am-hem. 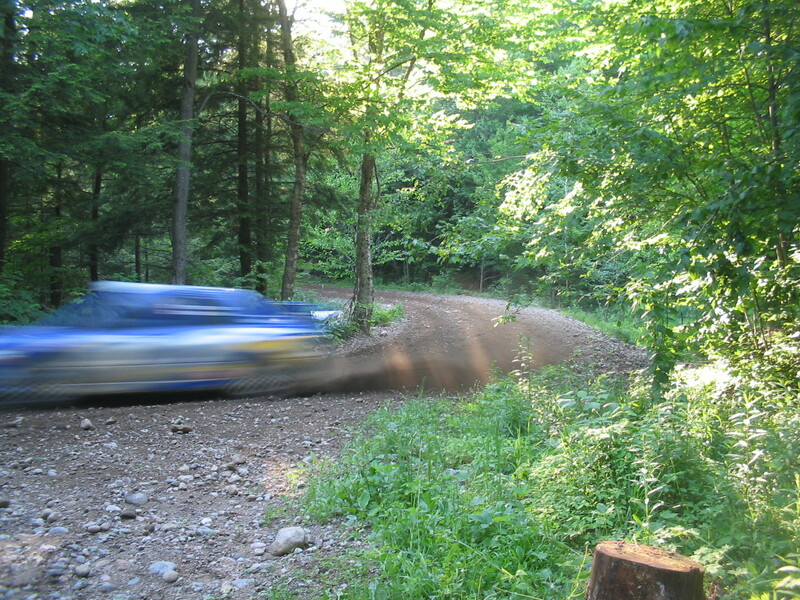 After entering a rallycross and volunteering at more performance rallies and not spending any time to really think things through at all they have a few drinks at Tall Pines 2009 (Ed – like every other day?) and decide to purchase a used Lada. This is either the best idea or the worst idea they ever had. Or it may be both things. When we last left our heroes (see here) they had just embarked on their performance rally career with a $500 van, a borrowed trailer, and a used Lada. 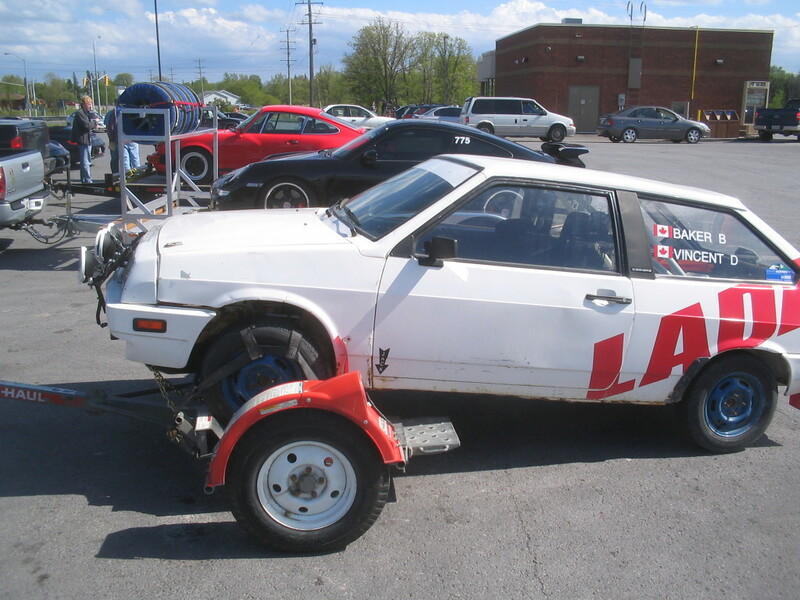 This is of course THE Lada, a 1991 Lada built by Lada Canada as a rally car – one of two – and which had the crap beat out of it for 18 consecutive years of rallying, including by such notables as ACP,. It requires a massive amount of human interaction every time you stop for gas but fortunately you don’t have to do that much, and it is a great car to learn how to rally in. This is important because our heroes (Ed – again?) know nothing about how to actually compete in a performance rally. 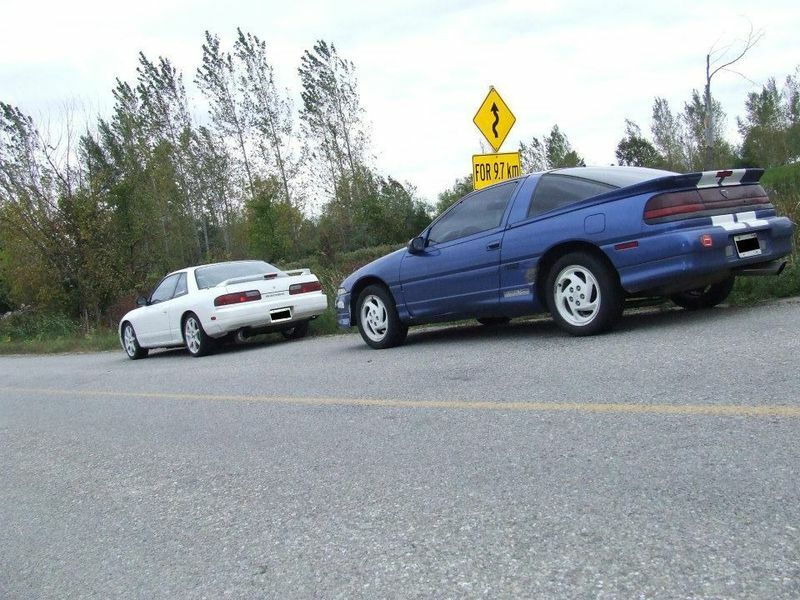 With no race experience beyond motorcycle track training (thank you FAST school – highly recommended) and practical experience limited to being paid to thrash underpowered front wheel drive cars (thank you Hertz and Avis Ottawa and the late 1980s) they attend Navigator school as a way to lure unsuspecting, umm, er, interested parties into the world of rally. Fortunately for all involved – and their families – The Lada is a very forgiving car to drive and fun even at low speeds. This is fortunate because low speeds are what you are going to get. So time to throw a license plate on it and go racing! (Note: plating and insuring a rally car is actually not quite that easy, but if you think some of this other stuff is tedious you don’t want to get us started on insurance and safeties and clean air tests…). At this point it is worth noting the origin of the REPOMANN plate. As part of the wise overall vehicle purchase strategy one of our heroes owned the Lada, the former TSD rally Jeep, the fan boy WRX, the Rally van, a Honda CBR 954 motorcycle, and a 1976 Buick LeSabre. What he did not own was a driveway. Eventually the Buick was sold and the REPOMANN plate, a tribute to one of the best movies of all time, got moved to the Lada. This created consternation at the Princess Auto among Keswick residents who believed that the driver must be a repo man, with whom they apparently had lots of experience with and hated passionately. It also caused a false positive with the po-po, whom pulled over our heroes at the Lanark rally one year on a transit when they ran the plate without a second N and flagged it as un-stickered. Always exciting to watch the rest of the rally traffic go by you while there’s an OPP with the cherries on explaining that he made a mistake. So now it was time to enter all the rallies that bank accounts could sustain! And how did that go, you ask? In 2010 we won the overall OPRC Production Sport class, which was not highly contested, but still, go us! We still won the OPRC Production Sport class and – now that the Lada was 20 – came second in the Classic division. Go us again! 2012: In 2012 we only entered two rallies, it seems. In short, between learning to tow, leaning to rally, learning to make notes, learning how to fix a 20 year old Russian car, and learning how to fix a 10 year old GM vehicle we had a good number of adventures. Remember the test day where we had a Lada vs. Canadian Shield contest and had to fix it in 2 weeks using structural stickers so we could race, only to hook up the fan backwards and overheat? Remember the mystery fuse? Oh yeah, good times. We had a great deal of fun in three short years but even using the vaguest definition of ‘safe’ we were reaching what we considered to be the limits of the Lada. As ACP put it, “The Lada has been a great training ground and has helped me refine techniques like left foot braking that I never used on the Volvo. But by the time we would go whole rallies without lifting the throttle pedal, it became evident that we needed more car.” Not that we’re saying we’re at ACP’s level, but there were some similarities in the experience. We were also getting to the point where we needed to put more work into it…which we were willing to do that if we were going to keep racing it, but given we were at the limits of performance that seemed foolish. As did trying to get more performance out of it, although there are some awesome turbo setups for these things in Eastern Europe. So sadly, to make room and money it was time to sell the Lada. What we decided that what we needed most was something that was going to get us into trouble at a much faster speed. Enter…The Manchurian. AKA Fabrication? It’s all true! Now that we had a car it was time to start stripping it apart. We got it to run long enough to prove the motor had all the parts and drove it onto the trailer to take it to the fabricator. To start, we needed a nickname for this car. The Lada was just called that, but The Talon makes you sound like you’re going to have to bring home justice from the Court of Owls to Gotham or something. Seriously. We called it the Talhoon sometimes, but that doesn’t really work when you say it out loud. You try it. The Eagle’s Fist makes us think of this. See how hard this race car business is? So we asked our friends to get on their nerd hats – some had them closer to hand than others – and with some help via the Intertubes we got: The Manchurian. Pretty catchy, huh? It refers not so much to the movie – which is really good, or at least the original is – but rather the Russian-Japanese war which took place at least partly in and over Manchuria. As we had a Russian car and now had a Japanese car in it’s place, we thought this was fitting. Also…NERD! We took the car to Ryan at Rally/Race Developments in Mississauga. We should say now that he was and is both a huge help and a great guy. 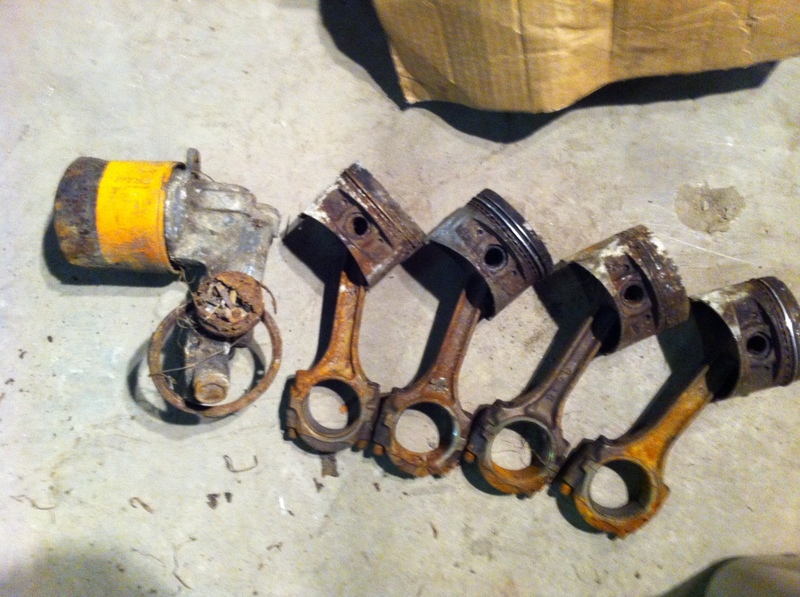 While it was there we stripped it down, we pulled the motor and threw it in the Jeep for a well-known 4G63 motor builder to deal with (more on this later), and we cleaned up horrible crappy seam filler and punky rusty spots that we hadn’t seen before as much as we could. Honestly, who thought that much crud could fall into ones’ eyes and mouth? Anyone who has worked on 23 year old cars, that’s who. 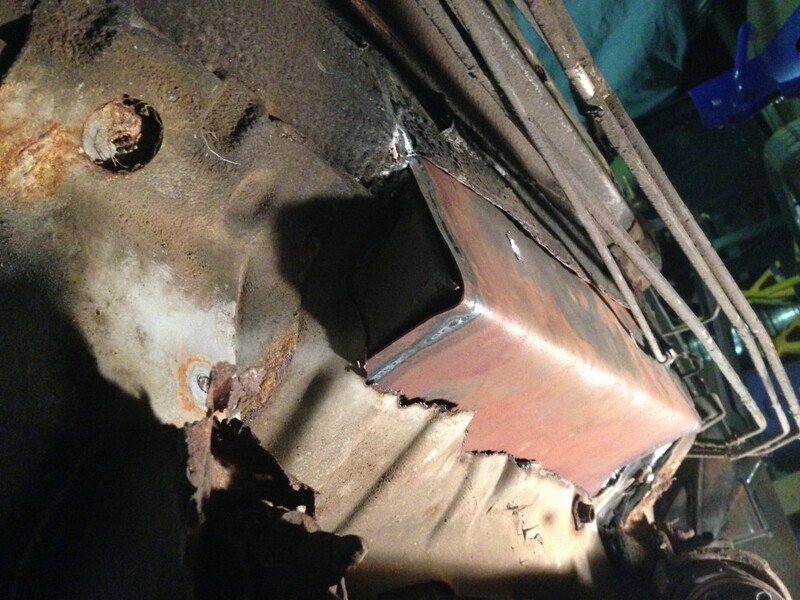 We found a fair bit of rusty stuff but nothing too bad so Ryan got the cage built and the seat bases and anchors in and the seam welding done while we did other stuff. You can check out all our old posts if you want more details, like here here and here. The head room looked a bit sketchy so we spent some time figuring out how to maximize that, we bought a rally suspension and a load of rally wheels and tires and some spares from Don Morton, who built and raced a 93 Laser with his wife, and we tried to get things sorted out so we could put it back together. 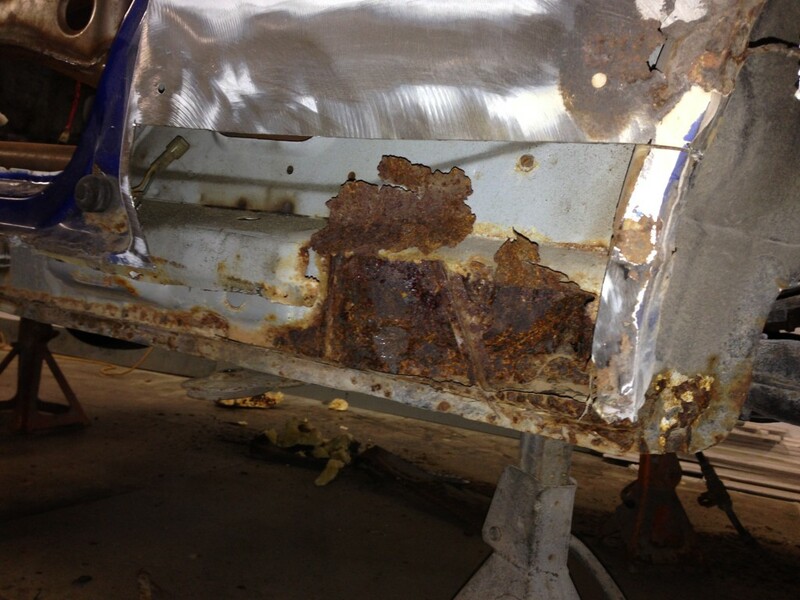 Then one day we pulled the body cladding off the doors and body of the car and….crap. 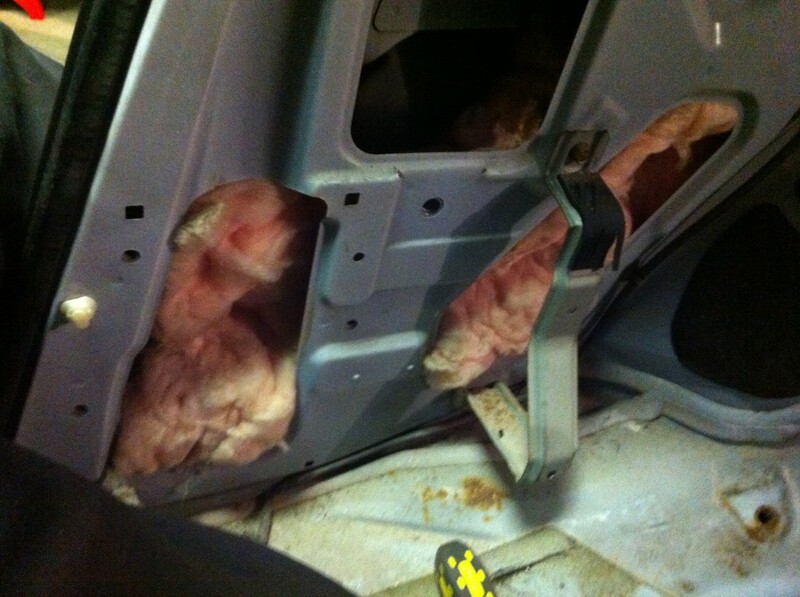 The sills were basically rotted out from the middle of the doors back behind the horribly ugly body cladding these cars came with here. On a unibody car, that is a Very Bad Thing. So now we had a car with a cage stripped down and sitting there and an engine getting rebuilt and a few thousand dollars worth of tires and suspension that fit that car and a tough decision: do we put more money into it or do we walk away? The cage isn’t coming out, so it’s one or the other. We drank some drinks and decided to plunge ahead. This now necessitated taking the barely rolling chassis to our man Zoltan at Oooonly Audi. He had his bodywork guy Jan tackle all the bodywork and paint. 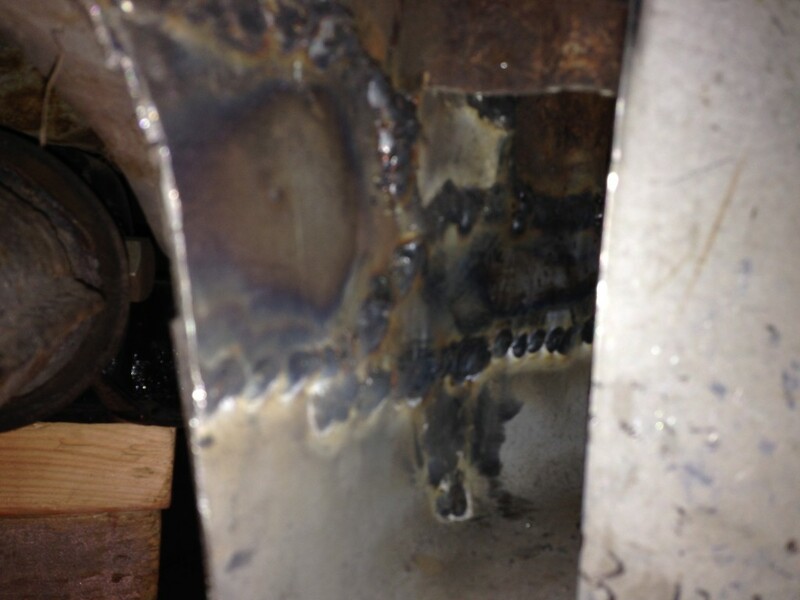 This included rebuilding the sills with steel that seemed more suitable for battleship repair, which was important. The entire car between front and back wheels is now a jacking point. 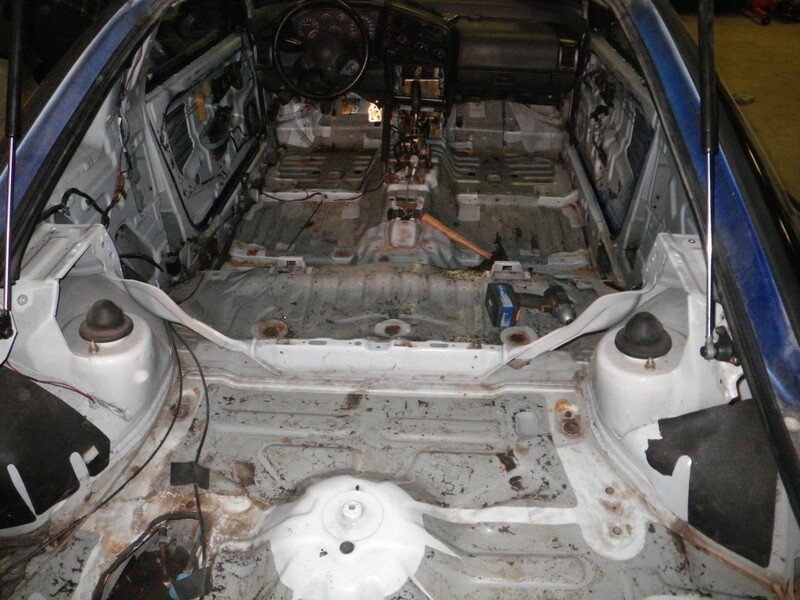 For paint we went with white for most of the body plus the interior, engine bay, and cage. The blue bits had been added over the white for most of the car when we bought it; to make the stripes they just taped off the original body colour and added blue around it. However, for the roof it appears someone had painted the original black roof and rear spoiler white at some point and then someone else added blue over top. So, yeah. Anyhow, we left some blue and the stripes where normally it would be black and went with that. We eventually got the car back around Christmas 2013, which made Pierce unlikely as our next race. Great, that gives us until Lanark! 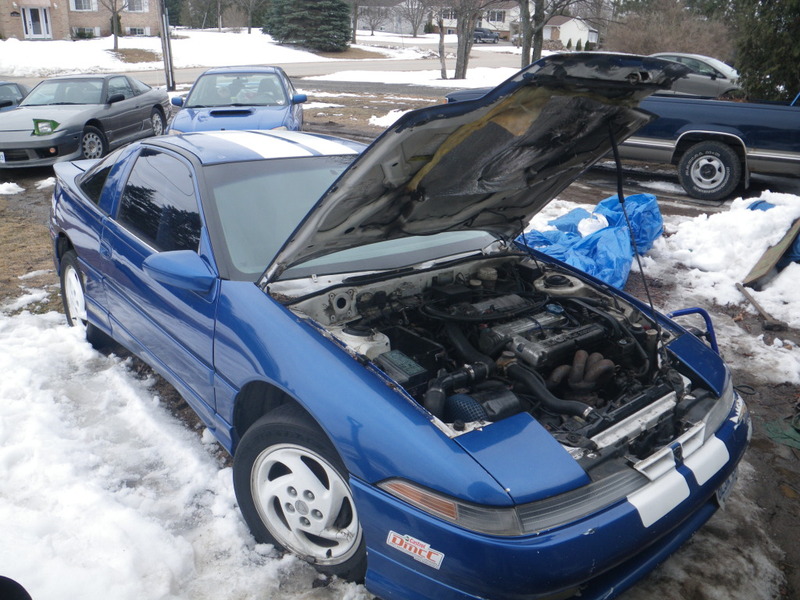 We also eventually got our motor back, or what we believe is our motor; there was some confusion in the DSM community around who had which parts, but we got most of what we think we sent and we were able to find the rest. 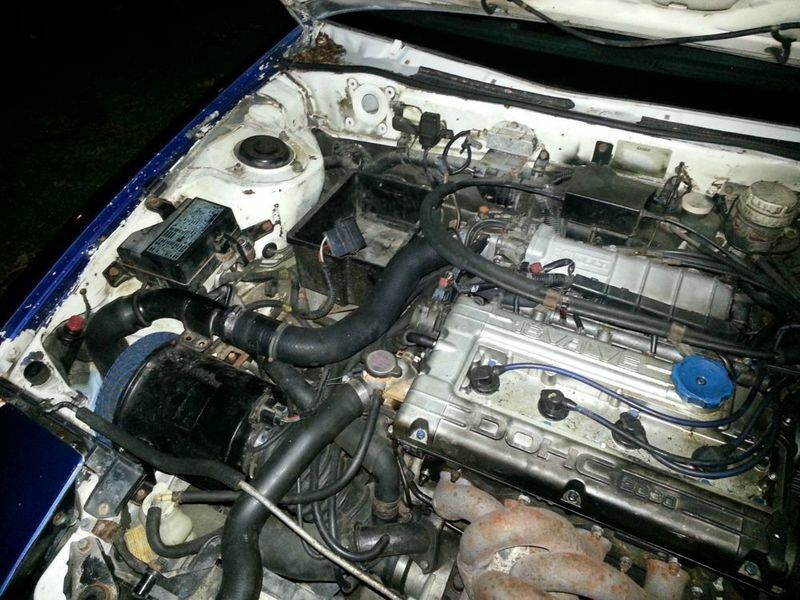 And when we eventually started said motor it ran great, so there’s that! 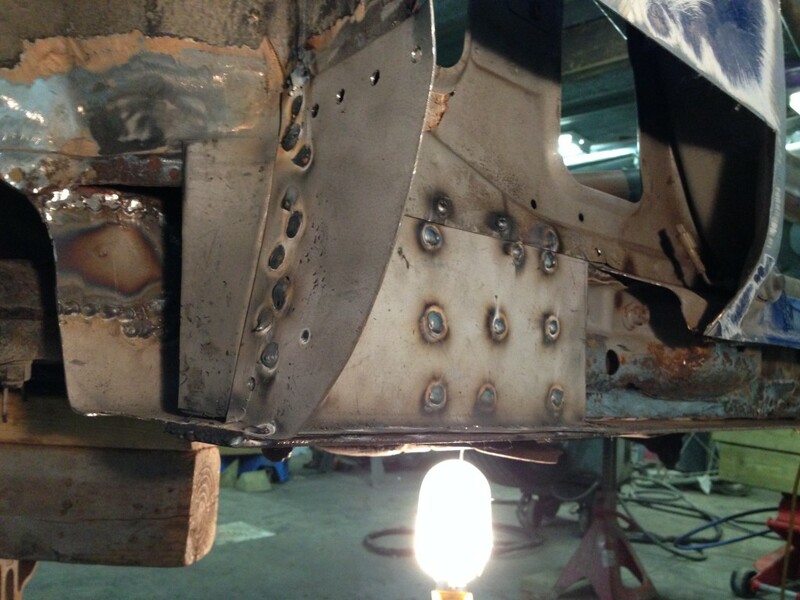 Through the winter/spring of 2014 we toiled mightily to get the car back together, and we can tell you that honestly there is no part of this car other than the transfer case, transmission and rear differential that we haven’t had apart. (Admittedly, we had someone else take the motor apart, but we took it out, put it back in, re-located the alternator, and attached everything else to it so we think we should get at least half credit on that). We realized we wouldn’t be ready for Lanark and we couldn’t race at Black Bear because one of us is foolish enough to be organize it – which apparently takes time or something – so we were aiming for Galway Cavendish. And…we went right past that goal, sadly. That would have been the perfect race to start with, too. So now it was time to hit the last race of the year, and also the biggest and hardest race of the year: Rally of the Tall Pines. In September 2014 – about 2 months before Pines – we knew that in order to have a car to race there we had to forsake all other fun, friends and family, unless they liked working on rally cars. This can be tricky but we did a pretty good job of reliably ditching everything we could. Thanks families! That got us to the point where we had a car that started and ran (badly; needed a tune) but we also had a laundry list of things to get done, and the car was in no way road worthy. Unless you think that doors and a hood are optional, having half of the bolts more than finger tight is a nice to have, an exhaust is luxury, and you won’t want wipers because there’s no windshield and besides then we’d need to buy the wiper arms, wiper transmission, move the wiper fluid reservoir and figure out how to install it, then figure out if the pump and wiper motors even work. Things like that. Plus we’re doing that for a 23 year old orphaned car, so it’s not as easy as walking to Canadian Tire or NAPA or even a dealer and ordering a wiper assembly. We had some practice with this with the Lada and to be honest this was a bit easier: at least there are still Mitsubishi dealers in Canada, although they didn’t have a lot of parts, and some things we could either get through a generic store or as performance upgrade parts through HSL Rallysport or RTM. 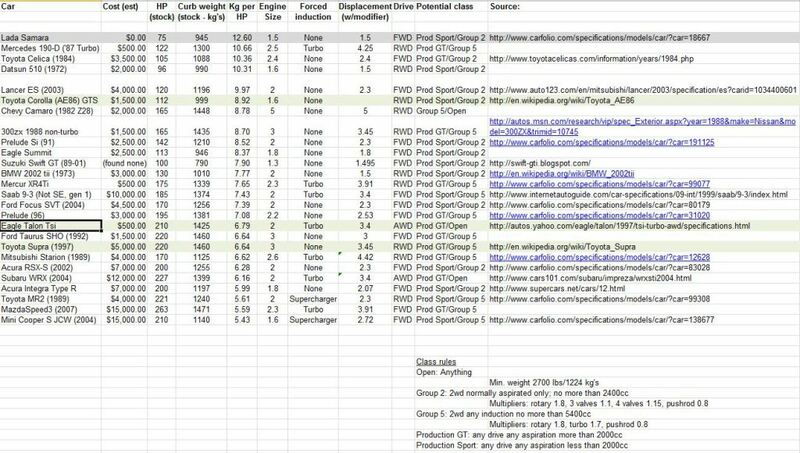 Most of these non-performance parts – of which there are a lot – we ended up troubleshooting and/or replacing through the awesome people on the DSM forums, who we relied on HEAVILY for both expertise and actual parts. They came through for us again on this stuff, as did Ziggy at RTM. Thanks guys! We also had to get the car back down to Rally/Race to get a windshield installed, skid plate made, light bar made, exhaust made, and HDPE armour cut/installed under it and in the wheel wells. 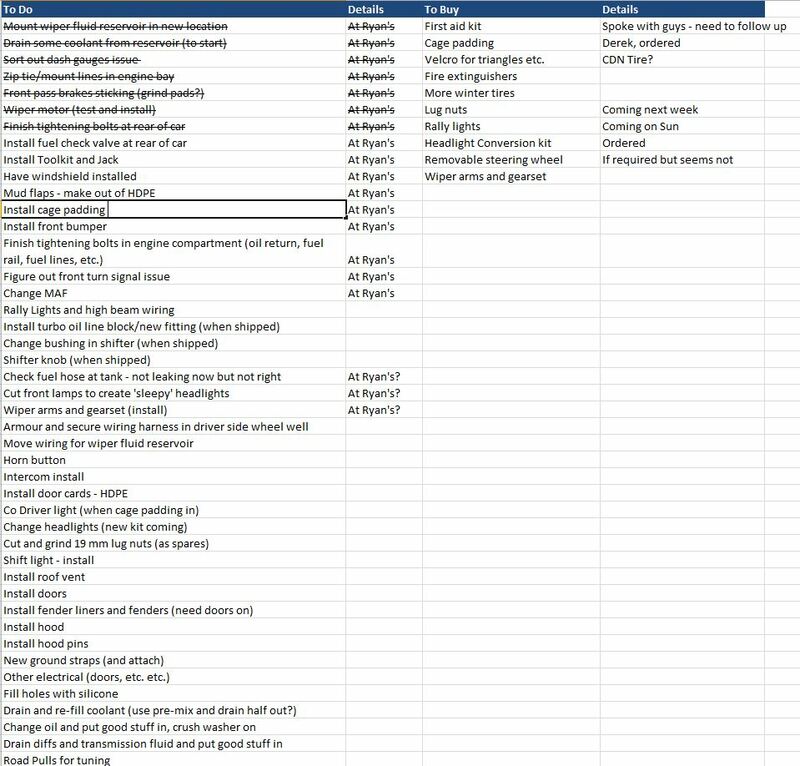 And as of November 4th – 23 days before we had to have the car on a trailer to leave for the race where it would have to pass a technical inspection – we still had a list of 33 things still to do. That we knew of. These were things like ‘get clean air test’, ‘get safety’, and ‘get insurance’ that would mean we could put plates on it and stop trailering it around, but they are also things that aren’t always straight forward with rally cars and which need to happen during business hours, which is yet another challenge when one is gainfully employed. And things like “Install toolkit and jack” ended up taking hours, as we needed to find a spot to put them that we could both access and offered a way to bolt to. So we were a little worried. We ended up working until the very early hours of the morning a whole bunch in the 2-3 weeks before Pines and asking our awesome friend Brian to run around to get the car, get fire-related equipment for the car, and go to Princess Auto while we were at work more often than we can count. 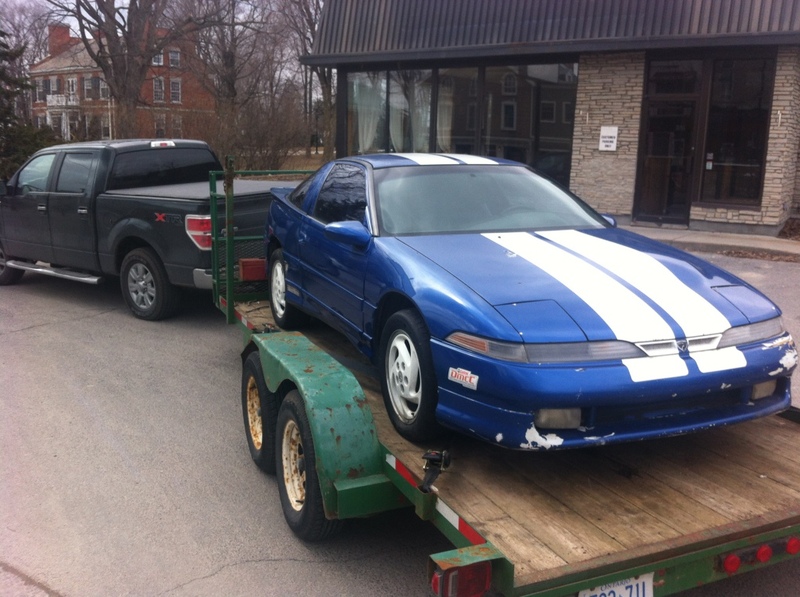 We were so close to the wire we delayed putting it on the trailer to leave for Pines so we could capture some WOT engine data on the country roads around our house so we could build a tune that night in Bancroft so we could actually try to race it. The haul to Pines with Drew’s truck was uneventful as we’d purchased quality tie-downs so the car wouldn’t slide into the front of the trailer again. Plus we loaded the truck up with every tire we could fit; Pines weather can be a bit unpredictable, to say the least, and it made a good cushion just in case the car moved. Friday morning we did Recce (where we drive the roads and review the notes the organizer provides to figure out how/if we want to modify them) in ‘Princess’, which is the name the lowered WRX with the big exhaust got when we didn’t want to recce Pines with it last time. Not having that happen again! Fortunately it has a skid plate, because the Golf ahead of us smashed their oil pan off a rock during recce and that was it for that car that day. 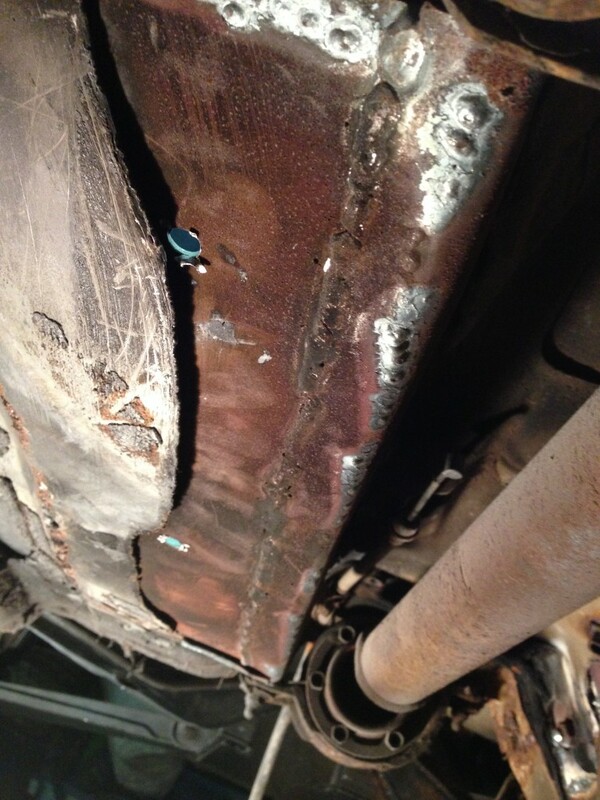 Princess was a champ and the exhaust remained attached. Hell, if Juggernaut can do it we can do it! (Quick aside: If you don’t know, the way a rally works is at the start of the race we are given driving directions and time to get to a Special Stage. This is called a Transit. Once at the stage we check in and when our turn comes we drive through that stage as fast as we can. Stages are closed public roads where we can do what we want; transits are regular open public roads where we have to follow the rules. When we’re done the stage we get our time and transit to the next stage. Eventually we come back to service to fix things and get gas, then we do the same thing more. Since it’s not like a race track and you don’t see the road you are racing on until you show up, the day before we normally get ‘pace notes’ or just ‘notes’. These describe the road in enough detail that you can theoretically drive it flat out with the co-driver or navigator telling you what is coming by looking at the notes. The recce, when we have one, lets us modify the notes we are given with our own details, or if we want to write our own notes from scratch, and then we use those when we race. We first used provided notes, then started writing our own – after we showed up at Pierce Neige and found out there were no provided notes – and since we are still learning the car we are back to using provided notes). While we did the recce Drew and Brian prepared the car and took it to the tech inspection. This happens for every race; as part of that the log book goes in to the organizer and it is returned when the race is finished. 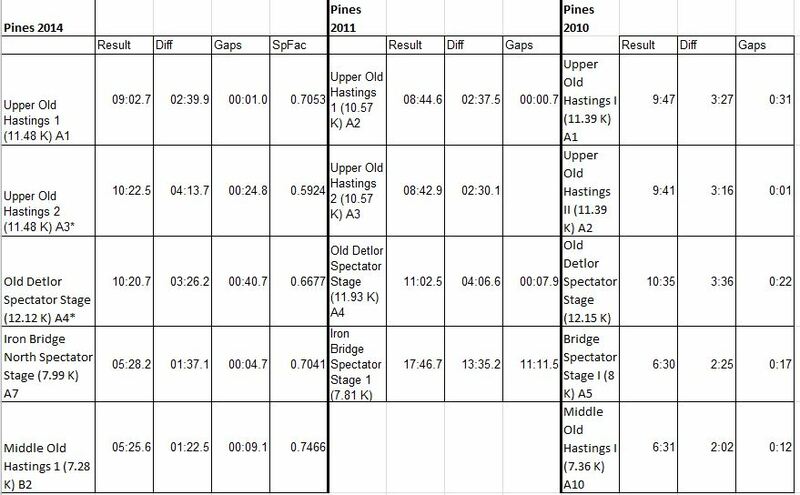 If the car doesn’t finish the result is recorded and if there is a crash then that area is inspected at the next rally. This gives every car a continuity/history that travels with the car. No problems there so we got back and tried to set it up for Shakedown that night. This is an optional run of part of a stage, at night, that you can use to set up the car, take people for rides (who fit into their helmet), etc. We of course signed up for this and paid the $50 because it was the first time we’d actually drive the car in a race situation and also the first time we’d read/heard notes in 18 months. The key was to not crash here because that would just be awful. And we didn’t! So that was one target down. The plan for the rally proper was to try get a feel for the car, get used to the notes, and most importantly NOT CRASH. We were very clear on that in our minds. Finishing was good but not crashing was key. Our first stage we saw someone off the road 200 meters in, so at least we wouldn’t be the first people to go off; one potential embarrassment milestone passed. 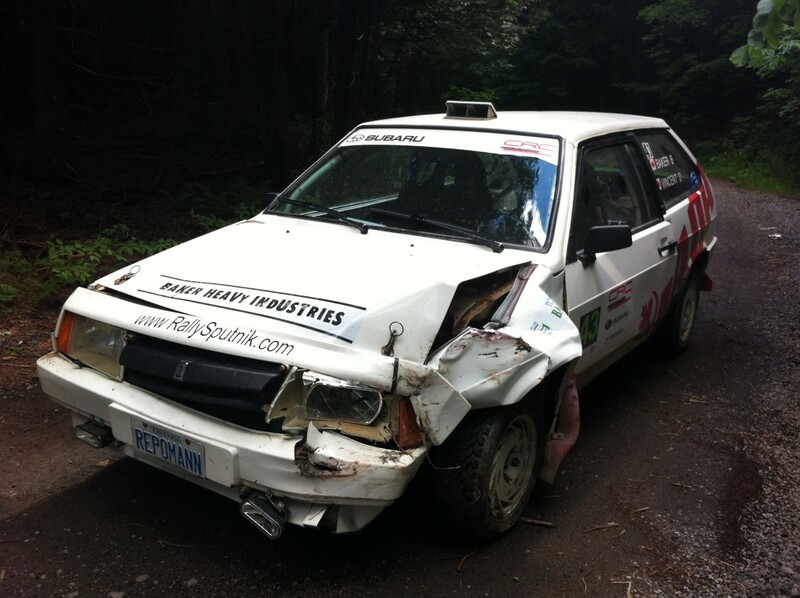 We finished the first stage and…no crash. Our first stage done! Not very fast, or at least it didn’t feel very fast, but no crash. We moved on to stage 2 and remembered to turn on the camera. And…better! The car felt great; it was understeering a lot because it needed to be steered with the throttle, and that was a bit of a problem when we weren’t comfortable with the notes in this car. Clearly the faster we went the better the car would be, and that’s what we were hoping for. Well, that and to get faster. However, even with the understeer it felt stable and planted….which is amazing because we put the steering and throttle and brakes and every other damn thing together and they were actually all working. 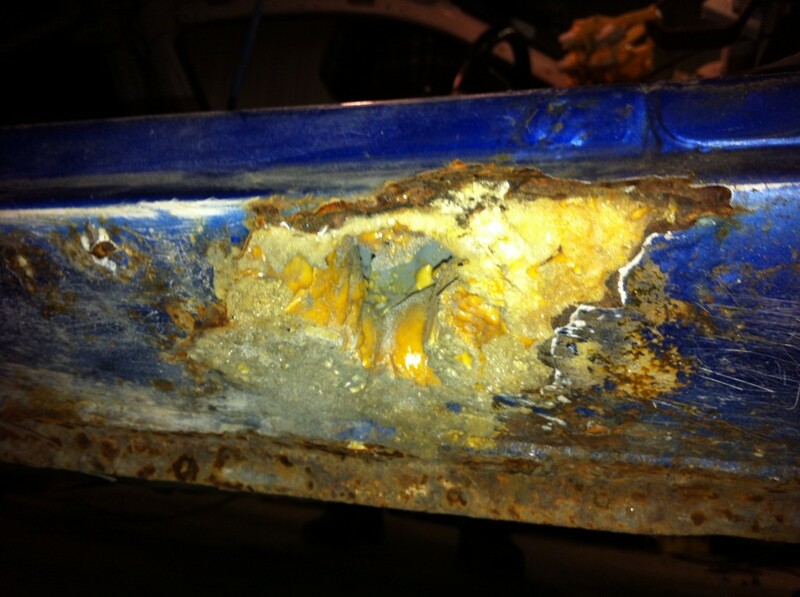 The new bodywork, seam welding and roll cage was also paying off as the car felt stiff and solid. We were having some occasional issues with what seemed like electrical/MPI earlier but they weren’t manifesting themselves yet. Bonus! Unfortunately, after the first 4 stages we started to have fuel starvation issues: the car couldn’t rev over 3000 rpm or take any abrupt throttle movements, like hard acceleration. This was a drag and we were inadvertently slowing down the competitors behind us so we returned to service and checked in, telling them we intended to re-start if we could solve the issue. We figured it was the fuel pump but didn’t have a spare, although we did have room for two in our fancy sender unit from RTM. Yeah, bit of an oversight there. While we were peering at it beside the car one of the head technical guys wandered by and asked what we were doing. We told him and he said “I’ve got a spare Walboro 255 – it’s in my bag. You want it?” We sure did. We threw that in, got the car inspected, and hit the road. This also removed the horribly loud whine the old one made. We ran another stage – Iron Bridge again, going down – and were watching one of the Corolla’s die with an ECU problem while waiting at the next stage when we started to have fuel troubles again. We started the stage with the intention of calling it quits after that but didn’t get that far; the problem was way worse and after seeing some carnage we ended up dead on the side of the road about 2 km from the end. Which put us at the furthest point away from the service area, and our service crew was 15 km from that, at the Golton special stage. Sigh. We got a tow out from some very nice Quebec volunteers who had water and snacks, and eventually Brian and Drew left Golton and got us with the truck, trailer and WRX (since we didn’t all fit in the truck). It was well dark by then but sadly we didn’t get to use our awesome HSL Rallysport lights and Ryan’s light bar other than for shakedown…although they do look pretty boss. We then packed up and headed back to the rented cottage for some drinks and some sleep. Overall we were really happy with the car and how it performed; best guess on the failure is that it was caused by the gas tank getting banged around, crud getting loosened up and clogging up the fuel pump, then some got through and made it to the filter. When we replaced the pump even more got sucked through and the filter clogged and the car stopped. So a drag, but an easy fix. And not a crash! (Turns out that it was actually an issue with the bung we put on the second fuel pump hookup; it got chewed up by the vacuum of the new properly working fuel pump and we were just circulating fuel around the sender. Replacing the bung fixed the problem so we will put two pumps in there for the next race). Our results from 2014 in the Talon are compared to roughly the same stages in the Lada in 2010 and 2011 are below. Not sure if they were all run in the same direction, which makes a difference, and clearly they were different lengths (e.g Upper Old Hastings was 11.48km in 2014, 10.57 in 2011, and 11.39 in 2010). However, it appears that AWD and horsepower can overcome a lack of practice when compared to 1WD, 80hp (at best) and commitment. Iron Bridge or Middle Old Hastings were roughly the same distance both years but the Talon was over a minute faster on each. That’s all down to the car so imagine what it’ll be like when we can operate it properly! Next steps for us are to tackle the remaining items on our list, so starting in April we will order and install the fuel pumps we need, put in the roof scoop, fix the turbo oil line, poke at the transmission, attempt to adjust out the side to side slop in the shifter (or just buy new shifter lines), adjust the brakes, install the shift light, fix up the door cards and oil the window mechanism, and figure out where all that camber in the rear wheels came from. To start. 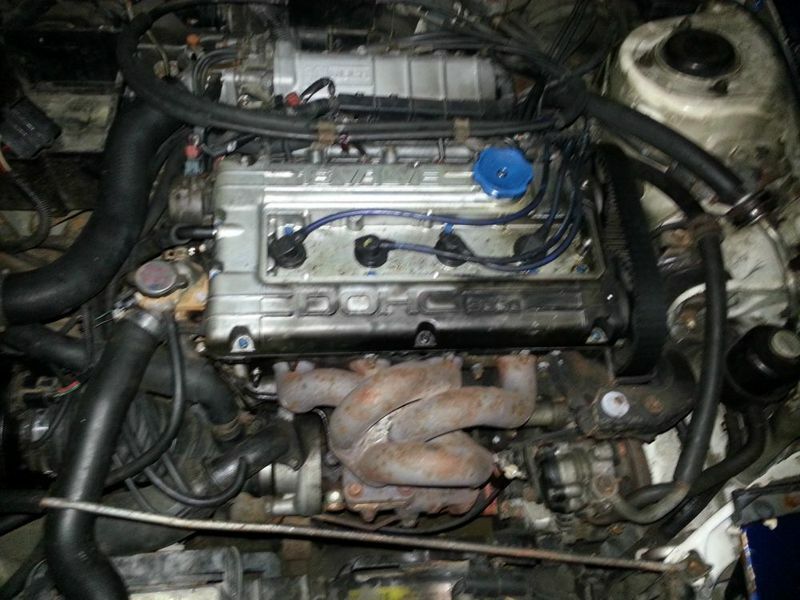 We also want to get it tuned properly, and then we’ll find out what kind of hp we have where. 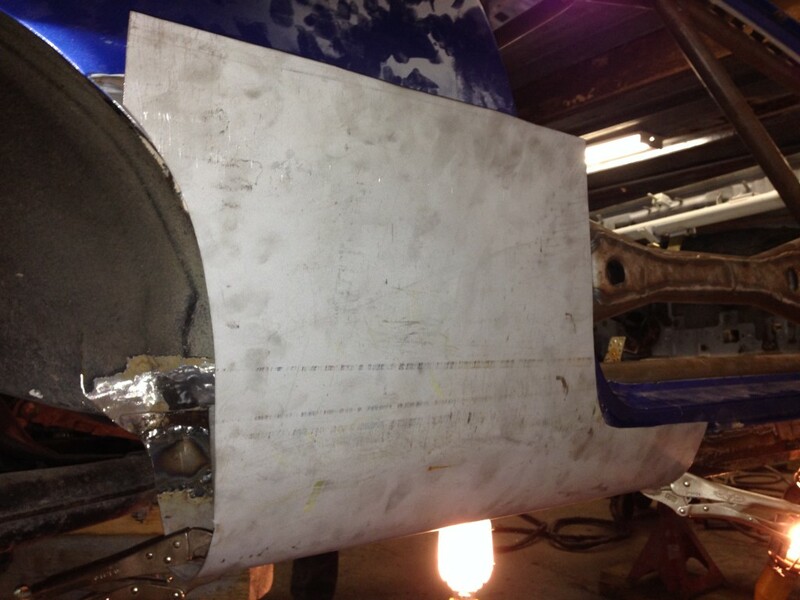 Don’t expect too much though – The Man requires us to run a 34mm restrictor on the turbo. It’ll still be interesting though. Also, before that we’re aiming to get the car out for the first ever Cars and Coffee in Schomberg, which should happen April 26. We’ll post a confirmation when we have it. We will also continue to update the blog as things ramp up and we’ll also continue to post on F-Book at www.Facebook.com/Rallysputnik. We have a youtube channel (www.YouTube.com/RallySputnik) and even Instagram and Twitter. Which we’ll work on updating more. We hope to hit all the Ontario rallies plus some test days and car shows, and we’ve already booked the cottage for Pines 2015!